An imaginative coming-of-age fantasy novella populated with diverse characters, magic and a whole lot of queerness – sound too good to be true? Well this is exactly what freelance writer J.M. Bates has created in her crowdfunded novella, Brilliant Shadows. With its beautiful cover by Asher Dumonchelle, this quick, bold read would be a worthy addition to any queer feminist shelf. Brilliant Shadows tells the story of Nattie, an androgynous paper delivery girl living in the gloomy city of Cobalt, a place where only a chosen few have magical powers, bestowed by shoulder-dwelling sprites called Shadows. Orphaned at a young age, Nattie lives at the local church, where a cruel nun takes her hard-earned money to buy silk sheets and romance novels. Nattie’s only happiness in life is her friendship with her boss’ daughter Blake, her comic books and her love of riding her bike – fast. One night she investigates a strange light blinking atop a water tower and meets Pyro, a tiny fire faerie Shadow, who chooses Nattie as her host. Now a whole new world opens up to Nattie, as she discovers her power and travels to the Otherworld in search of a new life. It is a simple story, almost a fairytale, with some complex and progressive themes. The story’s characters are diverse in every way, from race to body type to sexuality to gender identity. 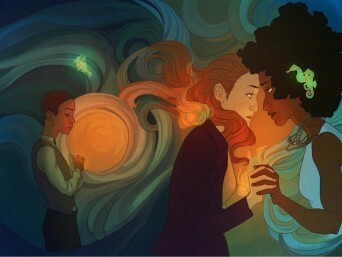 Almost every character in the novel is either explicitly, or implied to be, queer – from immortal lovers Rose and Mereida (who grace the cover) to the story’s young black protagonist, just discovering her lady feelings. Brilliant Shadows is a story set in a world where these things are non-issues, simple differences like blue eyes, never commented upon at all. What this does is create a very validating experience for the queer reader, while normalizing difference for others. What the story has to say about power is especially interesting. The Shadows are a perfect metaphor for anything potent and dangerous, and Bates uses the various characters to explore the right and wrong ways that power can be used. When used to learn and grow, to punish the truly wicked or to help others, the power of the Shadow is a wonderful thing, but when used for personal gain or to abuse others, it is a corrupting force that can only lead to self-destruction. The key message is that unearned power is a very dangerous thing. Underpinning this is the story’s emphasis of the importance of community and its belief in the enriching power of finding belonging. The characters with strong connections, who form caring friendships and are willing to make sacrifices for others, fair much better than those who choose a selfish, solitary existence. Brilliant Shadows is a vibrant, refreshing tale of power and community that shows how easy – and important – it is to infuse the fantasy genre with a little diversity. Posted January 13th, 2016 & filed under Entertainment.